Gazpacho is one of our go-to dishes in the summer and early fall, when tomatoes are at their seasonal peak. We also like to grill this time of year to give our food an added smoky flavor. So we were particularly pleased to find an easy recipe for grilled gazpacho soup, one that would be great for a warm evening on the deck or patio. “This grilled vegetable gazpacho takes gazpacho to another level – with additional crunch and a mellow smoky flavor from grilled corn, red onion and zucchini,” says Karin Calloway, a corporate chef and cooking instructor who developed this recipe for Viking Range. A popular Spanish soup, gazpacho actually has Arab roots. It originated from the Arabs who occupied a big chunk of Spain from the 8th to the 13th centuries. It’s evolved in a huge way since that time, when the basic ingredients were bread, olive oil, vinegar, salt and water. Today, gazpacho ranges in consistency from very liquid to nearly solid. 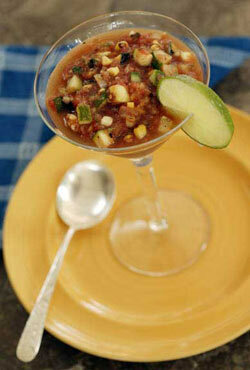 Calloway says chili powder and a dash of Tabasco give this gazpacho a kick. But she gives you options. You can also flavor the soup with lemon juice, red wine vinegar and fresh herbs. To make the soup, grill a zucchini, an ear of corn, and a small red onion. Next, tomatoes, tomato juice, diced cucumber and all of the grilled onion are puréed in a blender or food processor, along with chili powder and Tabasco sauce. The mixture is poured into a bowl. The zucchini is diced and the corn kernels are removed from the cob and added to the bowl. Add more diced cucumber. Refrigerate the soup until it’s very cold, about 2 hours. Then grab some bowls and your favorite libation and head outdoors for some al-fresco dining.